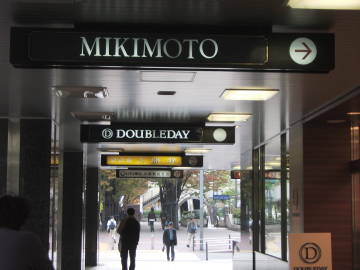 Join Me on a Visit to Mikimoto Jewelers in Osaka, Japan. 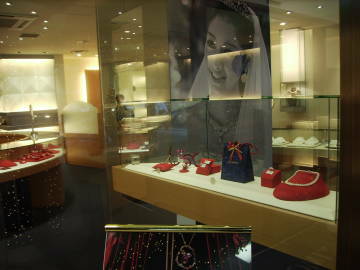 Mikimoto jewelers store ... Henry Mancini music put shoppers in a relaxed buying mood. 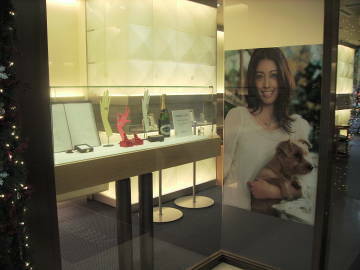 Couples were picking out wedding rings at this Mikimoto store where men and women equally buy jewelry. During this Christmas season couples come together so the wife can pick her own gift and the future husband can pay. A kind female saleslady help me and of all the salespeople in all the stores, I felt the most comfortable with her, maybe because she was closer to my age and spoke excellent English. She gave me some brochures and a phone number if I needed any more information about Mikimoto. Fresh white lilies in a vase were a nice touch. I asked about what looked like Catholic rosary pearls with purple tassels. She thought they were prayer beads for the Buddist religion. The watches with pearl strand watch bands were elegant looking. Here there were some pink freshwater pearls and a gorgeous light golden Akoya single strand necklace. The saleslady showed me some golden South Sea pearls for comparison which were much darker. Even the entrance rug to the store had Mikimoto on it. 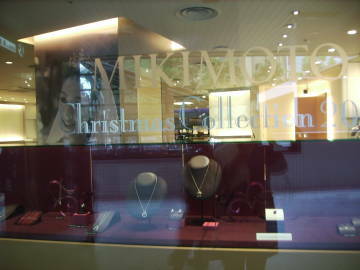 Once again, another pleasant visit to a Mikimoto jewelers store in Japan. 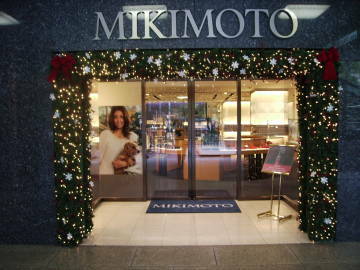 Return here for main Mikimoto pearl store page after reading about Mikimoto jewelers at Shinsaibash in Osaka.